On 15 December 2017, the competition Lithuanian product of the year was organised for the 21st consecutive time, and applications were assessed by a jury of professionals, who were specially teamed up for this purpose. This year, the confectionery factory Rūta presented an unusual product for the competition: "Šokoladinė pica", which won the gold medal. 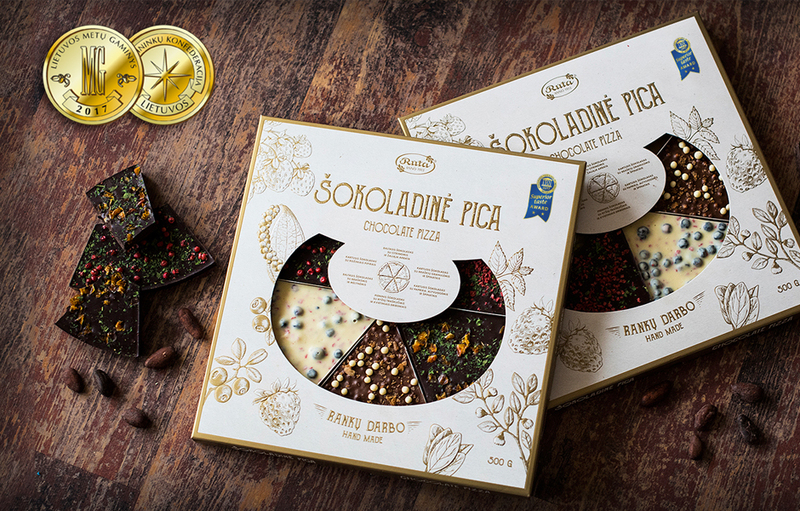 "Šokoladinė pica" is chocolate, a hot favourite with gourmets in Europe, South America, and the Far East, mixed with unorthodox ingredients, which has taken the astonishing shape of six slices of pizza, a modern work of art. The colours of the differently flavoured pieces of white, milk, and dark chocolate enriched with high-value herbs and spices and freeze-dried berries alone are something to behold. The Marketing Manager Kristina Briedienė considers that consumers are mostly amazed by the association with pizza, the most popular snack in recent decades, which is close to everyone’s heart. That is why the confectionery factory Rūta invites you to enjoy this unique product. After all, the greatest compliment to the creator is to see how the product is shared with others.